I switched from iPhone 3GS to a Samsung Omnia 7 with Windows Phone 7. Windows Phone 7 has a really great user experience, especially with a great display like my Samsung Omnia 7 has. I even like the user experience of Windows Phone 7 much more than the user experience of my iPhone 3GS. And the development of apps with Silverlight is totally awesome. The second one is very amazing. On my iPhone I was able to open the Maps-app, enter a street and streetnumber and the app displayed me the route to it from my current location. The “Maps”-Application on Windows Phone 7 just displays my current location, it can’t display a route. Oh, I can hear you say “no, that’s not true, it can display a route”. You’re correct, but for some users the functionality is not there. And as I found out, it’s based on regional settings. Is this a bug or a wanted behavior? I don’t know. Maybe Microsoft can give a statement to that. For me it doesn’t make sense to show a different set of buttons for Switzerland than for Germany/US and other regions. When you’ve set up your Phone with region German (Switzerland), in the maps-app you can just look at your location, but there’s no way to get a route to another location. When the region is switched to German (German), you can enter a route to another location. Let’s look at the screens. Here is the screen with German (Switzerland) setting. Notice that there are just two Buttons in the ApplicationBar. One to jump to the current location (Ich) and one to search (Suchen). The latter one just opens Bing-Search with the current location. When I now go to the settings of my Windows Phone 7 and set everything from Deutsch (Schweiz) to Deutsch (Deutschland), I get an additional icon as you see on the following screenshot. 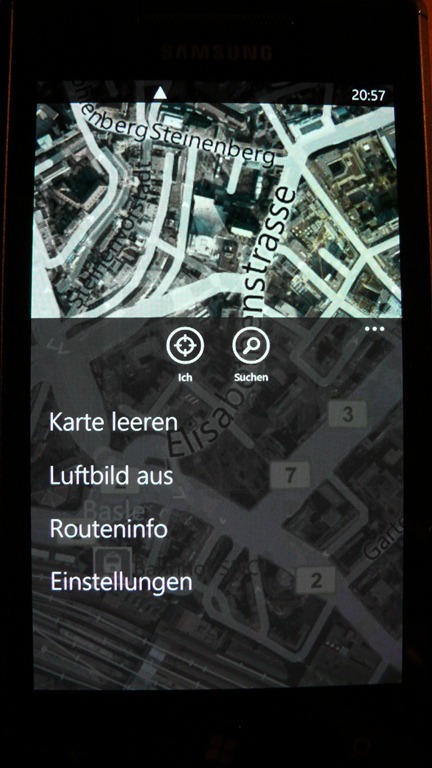 If you’re a swiss guy, set all to Deutsch (Deutschland): Now enjoy your Maps-App. that’s amazing. Same thing on my phone. 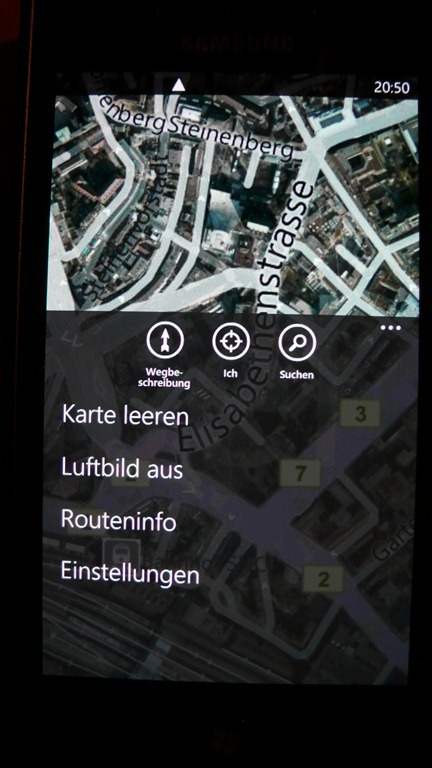 The crazy thing is that you can navigate to locations in switzerland if you set your locale to German (Germany).